2018 | Canada | NR | 87 min. Slater Jewell-Kemker didn’t set out to spend her teenage years making a film meant to inspire others to act on climate change, yet 10 years later, it's making its world premiere right here at TCFF. Slater was just 15 years old when she started questioning her local politicians about their inability to pass laws to protect the environment. 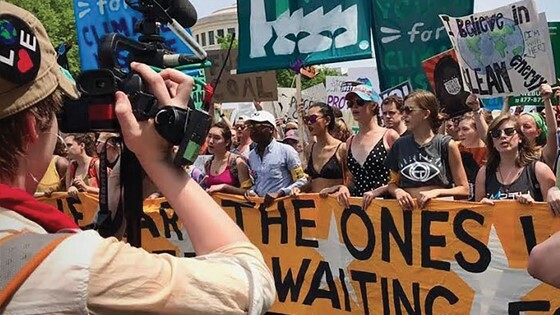 Soon she began to connect with other young activists doing their part to save the planet, and she took it upon herself to document their eco efforts and growing movementon camera. Traveling around the globe on the front lines of climate change, Slater captures the inspiringvoices and fierce tenacity of those too young to voteto have a say in the direction of the planet they will inherit, and you can feel the passion in every frame.Produced by TC's very own Amy Smart, Youth Unstoppable takes us on a journey that lets us connect with the activists of the next generation and instills hope to know that the future is in their capable hands. IN PERSON: Director Slater Jewell-Kemker; Executive Producer Amy Smart.